Redesigned for 2019 and ready for battle, the RM-Z250 marries the sleek, race-ready appearance of the RM- Z450 with an upgraded engine and list of chassis changes to achieve superior performance. Using Suzuki’s “RUN, TURN and STOP” philosophy, factory engineers have made the 2019 RM-Z250 an even more formidable competitor. The RM-Z250 has always set the standard as the best-handling 250 on the track. Now, the 2019 edition has more power, thanks to a host of changes that include a new cylinder head and dual injector EFI, to boost perfor- mance through the entire rev range. The frame and swingarm are new, as is the KYB-supplied suspension that includes a new coil spring fork. Strong brakes and ergonomically shaped bodywork that help keep the rider in control as the RM-Z250 carves up the racetrack. Back in the pits, tuning the new EFI system for maximum performance is easy, thanks to Suzuki’s proven fu- el-coupler system. Suzuki’s Winning Balance is again on display with the 2019 RM-Z250, as it again raises its own high standard for cornering performance. • Fitted with a new cylinder head and other improvements for 2019, the fuel-injected, 249cc, liquid-cooled, four-stroke, four-valve, DOHC engine remains proven and reliable. The cylinder head features a new intake port shape and nish that ne-tunes the fuel/air charge into thecombustion chamber to increase engine output. A 30 percent larger air cleaner opening is combined with a more direct air cleaner outlet tube path into thethrottle body for increased air ow. The updated fuel injection system has extra-smooth power delivery, high fuel ef ciency, superb reliability,and easy tuning capability. The new throttle body eliminates complex control linkage so the rider feels a more direct connection to the engine. For the rst time on a Suzuki MX model, twin fuel injectors are used. The fuel/air mix created by both injectors improves charging ef ciency and increases high rpm power. To feed the new twin-injector system and mix the fuel and air charge to improve throttle response, the new, high-capacity fuel pump has 17 percent more output pressure. The new throttle body eliminates complex control linkage, so the rider feels a more direct connection to the engine. The compact aluminum cylinder is finished with Suzuki Composite Electro chemical Material (SCEM) coating for durability, light weight, and ef cient heat transfer. Engine starting remains simple, due to a proven kick-starter and automatic decompression system thatworks precisely and ef ciently (eliminating the need for a heavy and costly electric start system). The new, high-low exhaust system has a longer head-pipe, tapered mid-section, and multi-layer silencer that has better ow through the entire rev range, with an emphasis on low-rpm performance. The new exhaust silencer is a four-layer design that enhances performance and maintains compliance with AMA sound regulations. New resin engine protectors help guard the coolant pump (on the right) and the stator cover (on the left) from debris and stones. For quick fuel adjustments to suit riding conditions, two couplers are provided. One is for a rich, and another for a lean fuel setting compared to the stock setting. Riders can change fuel settings in seconds by simply connecting either coupler to the wire harness. The 2019 RM-Z250 features an evolved and faster traction management system. The Electronic Control Module (ECM) continually measures throttle opening, engine speed and gear position and then adjusts theignition timing and fuel injector duration to ne-tune the engine output to deliver the best traction for theriding conditions. 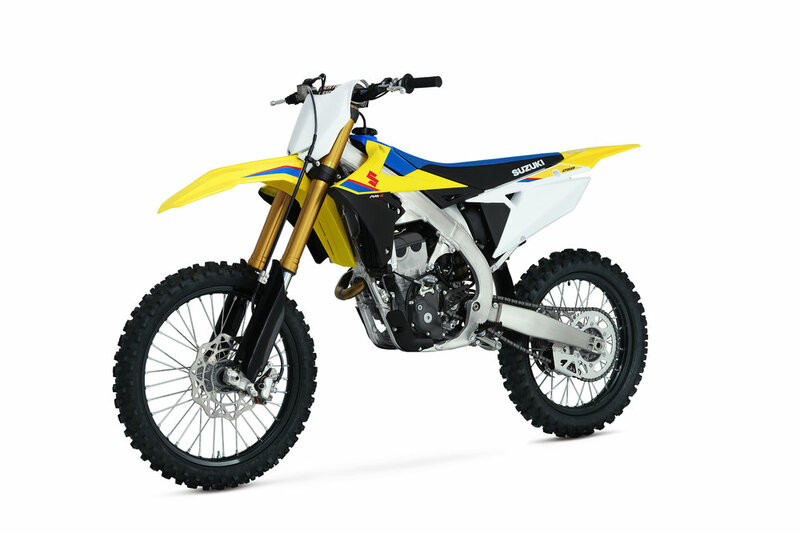 The RM-Z250’s traction management system is different from a street-bike traction control system as it does not measure rear tire spin. 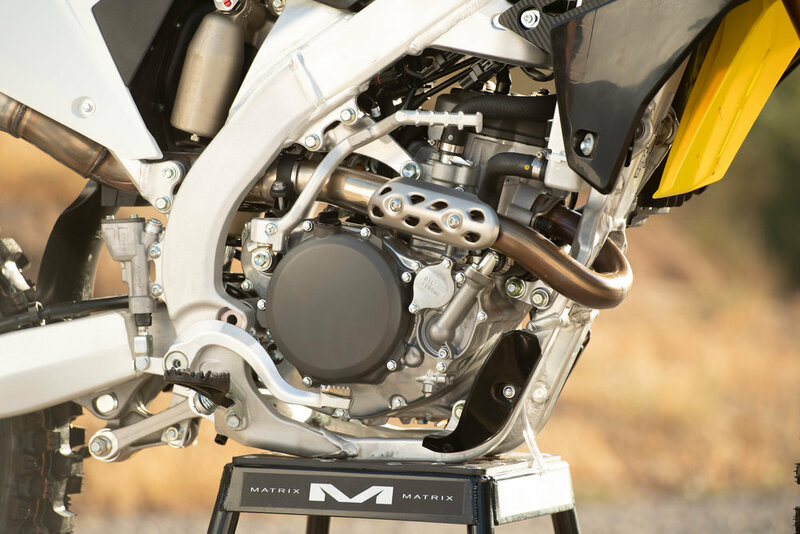 Because the needs of a motocrosser are different than a street bike, this system offers constant adjustment that maximizes traction at all times. 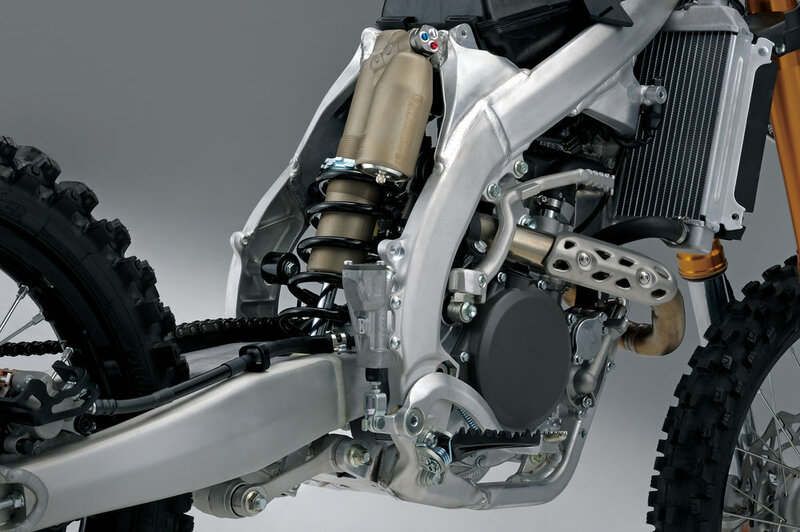 The Suzuki Holeshot Assist Control (S-HAC) is a selectable launch system derived from the factory race bike to help riders’ takeoff from the starting gate for an early lead. To aid riders at the moment of launch, there are three stages of power adjustment from the S-HAC system; 1) the moment of initial launch, 2) when crossing the starting gate, and 3) acceleration up to full-speed. There are three S-HAC modes riders can choose for the best option per their skill level and starting conditions. The launch settings for A-Mode and B-Mode are updated on the 2019 RM-Z250 to help the rider control engine speed during starts. A-Mode: For hard surfaces or slippery conditions at the starting gate. In this mode, S-HAC alters ignition timing at the moment of launch and the ride over the gate to reduce wheel slip to deliver a smooth take off. It also advances ignition timing during this sequence for stronger acceleration. After 6.0 seconds or when you reach fourth gear, the system shuts off and returns to normal ignition timing. Benefit of A-Mode: For novice riders, and/or hard and slippery traction conditions, use A-Modefor a more controlled launch. B-Mode: When conditions at the starting gate have better traction, and a more aggressive launch is desired. S-HAC will advance the ignition timing to allow increased throttle response and stronger acceleration off the line. The ignition timing alternation is in a similar sequence as A-Mode, but with increased overall timing. One of three conditions will return the ignition to normal operation(whichever happens rst): After 6.0 seconds or when you reach fourth gear, the system shuts off andreturns to normal ignition timing. Suzuki Motor of America, Inc. ai3 09/06/2019 3 /6Speci cations and other information may change without notice. • The five-speed transmission is updated with a new second gear ratio and overall nal ratio to match theengine’s stronger output for better acceleration and top speed. 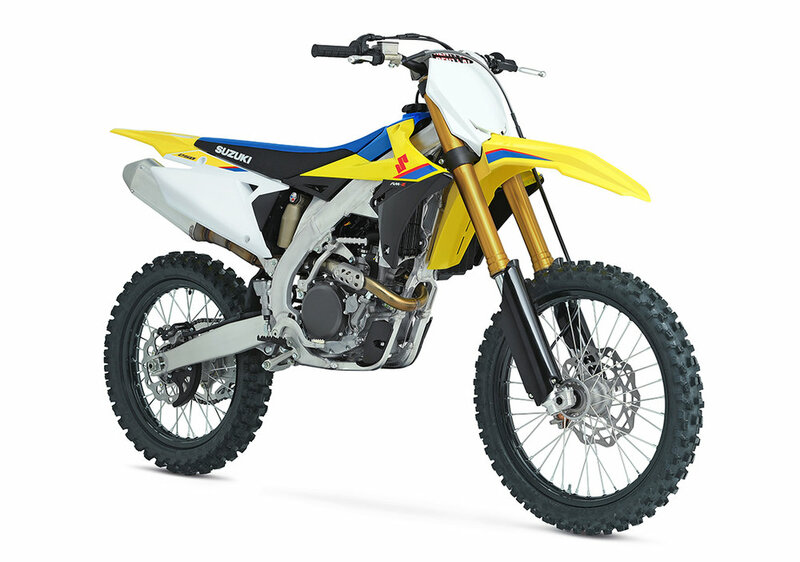 • The 2019 RM-Z250 features a new frame and swingarm design that continues Suzuki’s reputation for creating the best handling motocross motorcycles. The new aluminum-alloy twin-spar frame combines cast and extruded sections to achieve superior front- and-rear weight distribution while balancing strength and weight. The new frame is 370 grams (0.8 pounds) lighter, but has a 10 percent increase in torsional rigidity. The position of the engine in the new frame is changed so the crankshaft sits higher in the chassis to further the bike’s nimble handling characteristics. The new swingarm is shaped using an innovative hydroforming process that maintains strength but reduces weight by 0.6 pounds (270 grams). The new hydroforming process enabled engineers to create tapered swingarm beams that increased rigidity while reducing heavier assembly welding. New hexagonal aluminum rails are used on the sub-frame for lighter weight, a slimmer appearance, andeasier air lter access. The sub-frame rails are moved inward to slim the bodywork, but are also raised to provide additional space for the larger air cleaner. Not only is the new sub-frame narrow, but all of the body work is slim so the rider can move freely in the cockpit, especially during spirited riding. • The new, KYB-supplied shock absorber has a thin-wire spring, spring guide, cushion rubber guide, and lower link that weigh less and have better movement reaction. The new spring and link weigh a pound (447.5 grams) less than the prior parts. This KYB shock has new damping force circuits and a different rear lever ratio to improve the suspension’s traction characteristics. The damping force adjusters have a wider tuning range so the settings can better match the conditions and the rider’s style. A new, high-performance KYB coil spring front fork replaces the PSF2 Pneumatic Spring Fork previously used on the 2018 RM-Z250. Both fork legs have the same springs and damping force components, so front suspension tuning andmaintenance is balanced and easy: a great bene t during frequent riding. This new fork uses a free-piston design that separates air and oil to optimize the damping characteristics. Other internal changes help control the damping cartridge’s pressure and spring recoil, so the fork action remains supple and precise. The new Renthal aluminum tapered handlebar has a straighter bend (less pull-back) than prior models to help aid the rider during aggressive maneuvering. A new, lighter upper fork bracket is used to complement the new front suspension and handlebars. To improve stopping performance and feel, a new, larger 270mm, wave-style front brake rotor and a Nissin two-piston brake caliper are used. The brake pad material is also changed to improve performance, plus the new front brake lever is a push rod type that more effectively transmits the squeezing force that the rider applies to the master cylinder. A new design rear brake master cylinder hugs the frame beam to reduce dirt contamination and the chance of the rider’s boot touching it during riding. The wheels feature black anodized D.I.D DirtStar rims with a new cross-section design that maintains strength while reducing un-sprung weight. Suzuki beak-inspired styling has sharp front fender and radiator shroud shapes that blend into the frame’s side covers and an upswept tail, to promote the impression of speed while reducing weight and easing service. 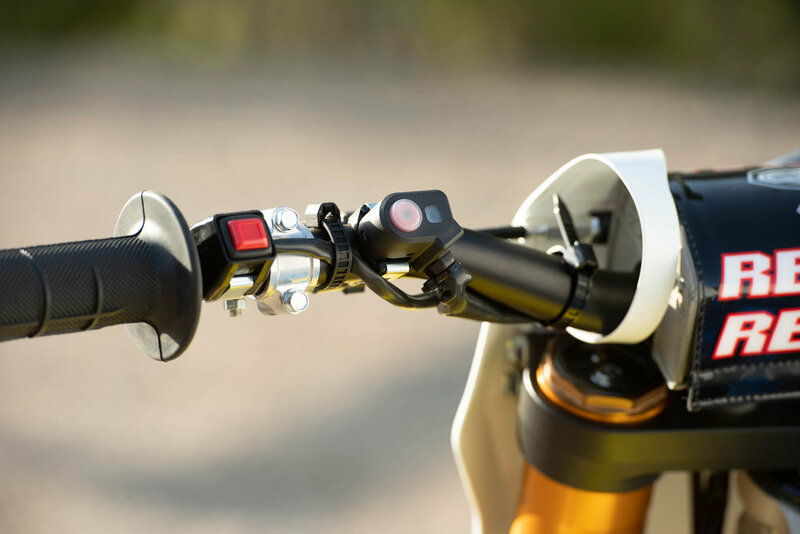 In addition to the ergonomic improvements from the new bodywork, the rider’s foots pegs are moved 0.12 inches (3.3 mm) forward and 0.2 inches (5.2 mm) upward, while the handlebar grip position is moved 0.3 inches (7.4 mm) forward and 0.15 inches (3.8 mm) downward, to create a high level of rider-control during competition. The new plastic fuel tank weighs a half-pound less than the prior model’s aluminum tank. Fuel capacity is raised to 1.7 US gallons. The seat base, inner fenders, and side covers were developed to reduce moisture and dirt from reachingthe air cleaner. This helps prevent debris from contaminating the air lter. The new, slimmer seat has revised foam density to aid the rider’s control of the motorcycle. The seat weighs a half-pound less than the prior model’s and has a large gripper panel that runs nose-to-tail on the cover. • A variety of Genuine Suzuki Accessories for RM-Z250 owners are available including a large selection of Suzuki logo apparel. Learn more about Suzuki’s industry leading contingency, plus the RM ARMY and Amateur Support programs at www.SuzukiCycles.com/Racing. For more details, please visit www.suzukicycles.com. We were expecting a new YZ250F from Yamaha in 2019 and that is exactly what we get. The kids will also be stoked to learn that Yamaha made some major updates to the trusty YZ85 while the 2019 YZ450F only gets minor updates. What you see on the 2018.5 450 SX-F Factory Edition has made its way to KTM's new 2019 SX-F model lineup. Take a first look at the 2019 KTM SX & SX-F Motorcycles here. 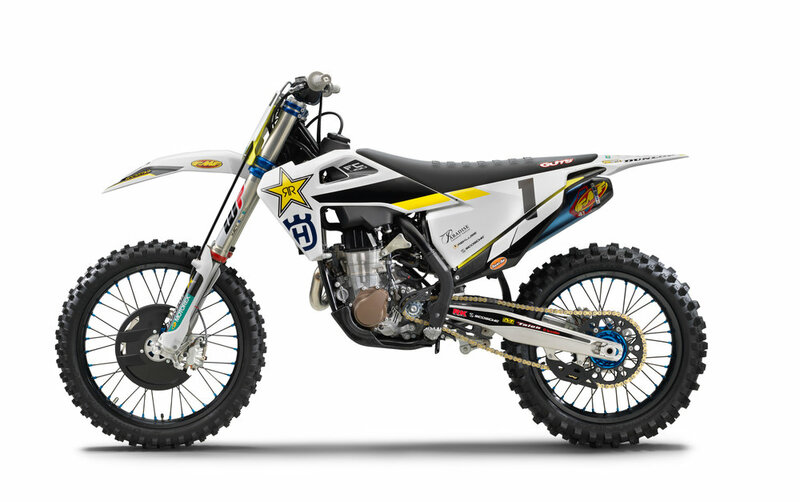 Husqvarna's 2019 off-road lineup has arrived with their TE and FE line of motorcycles. 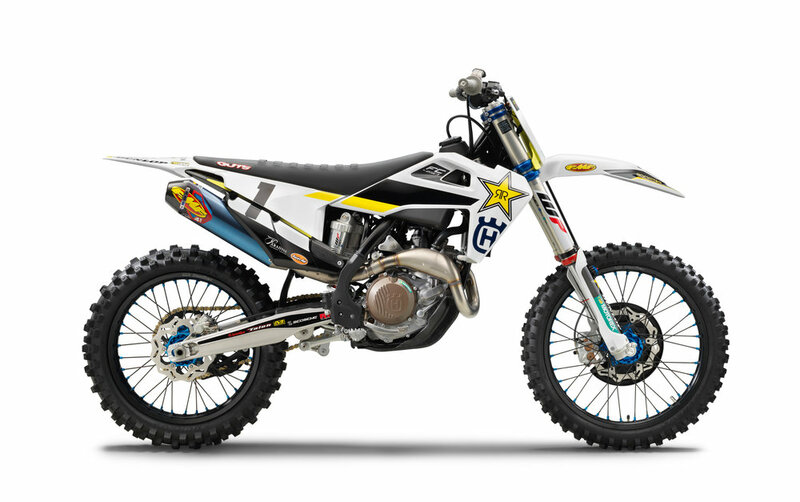 Check out the 2019 Husqvarna TE and FE off-road motorcycle models here! Take a first look at the 2019 KTM XC, XC-W & EXC off-road motorcycles including the 2019 KTM 300 XC-W TPI; check out the photos & specs just released from KTM here.